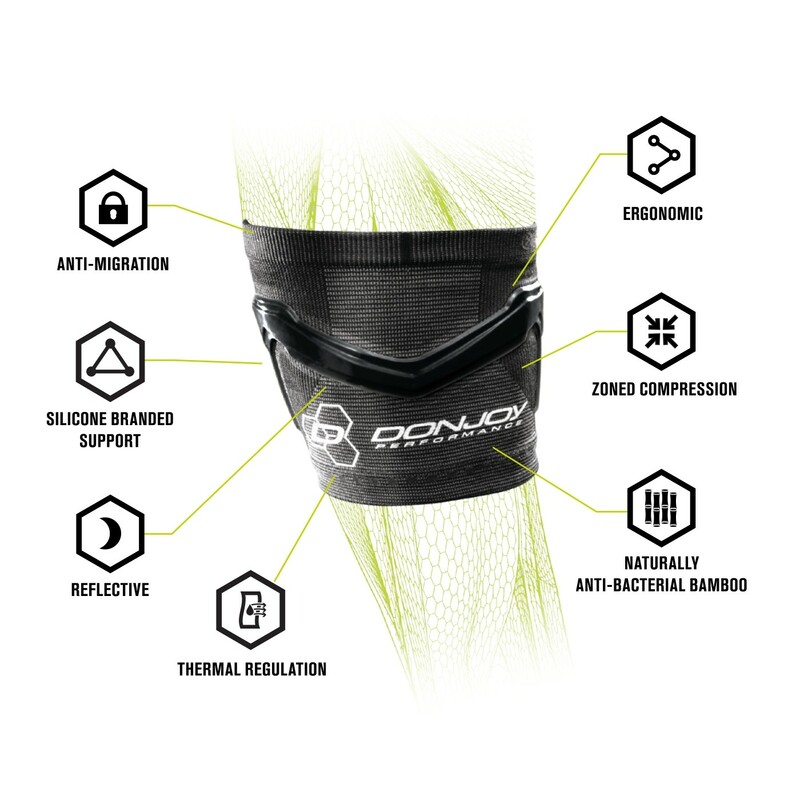 Our DONJOY Performance Trizone Tennis/Golf Elbow sleeve is a hybrid design combining the properties of compression and bracing in a single sleeve. The carbonized bamboo circular knit construction allows for targeted, zonal compression with thermal regulating properties. Three distinct compression zones which include: a stability zone with strategically placed injected silicone to provide constant pressure to the medial/lateral tendons in the forearm and the benefit of enhanced proprioception, a compression zone which improves circulation and provides mild support to the joint structure and surrounding muscle tissue, and a comfort zone that provides lighter compression for enhanced fit and range of motion. 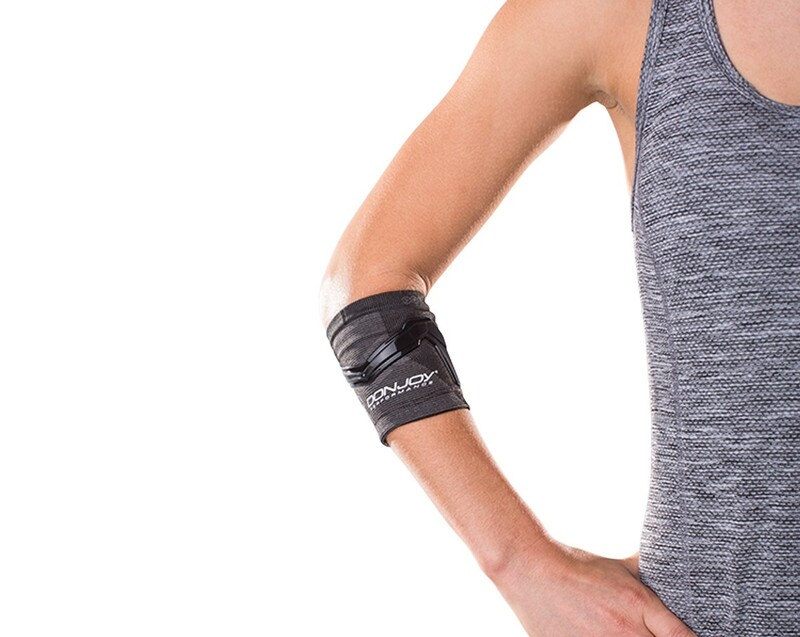 The elbow compression sleeve provides all day comfort with everyday arm movements as compared to traditional tennis/golf elbow products on the market that require and air bladder and static hook and loop closure system. 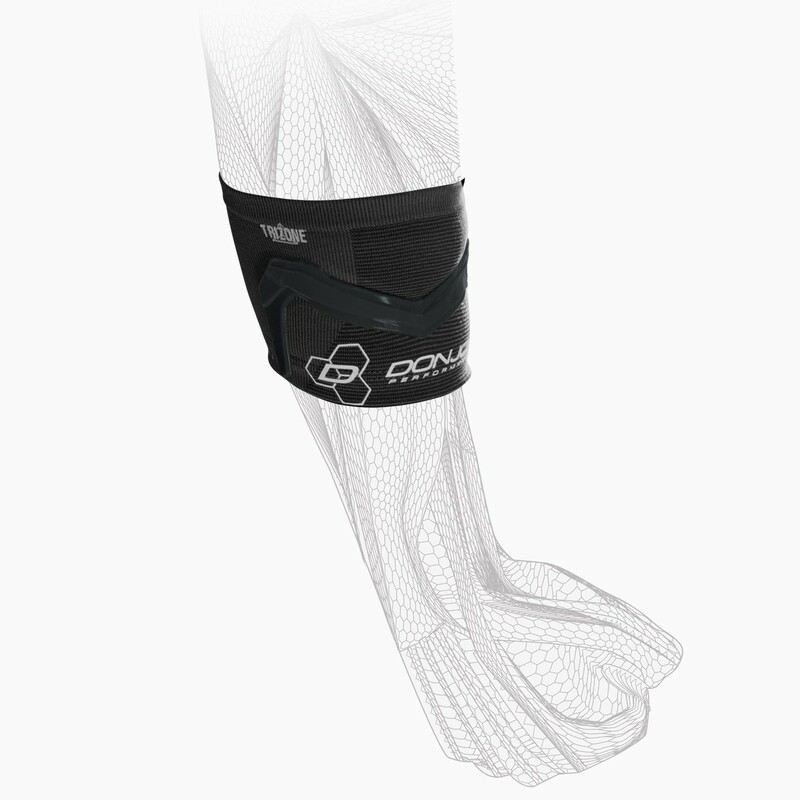 The Trizone Tennis/Elbow support is a low profile performance product designed to relieve pain from both tennis and golf elbow. Had a Partially Torn bicep in 2010. I was diagnosed with Golfers Elbow at the same time. (2) Months ago I had a partial Pronator Teres tear in the same arm (right). This is from constant repetition in competitive bowling. Would this be the right support to go with or would something like the Trizone Elbow Support be better suited? hello, i am a tennis player, playing for 20 years now. got triceps pain, that later on is becoming to elbow and wrist pain. I am aware of carpal tunnel problems, but do you think, that trizone tennis support can help me in this case, or should I look for trizone elbow support to support more triceps and higher parts of arm? 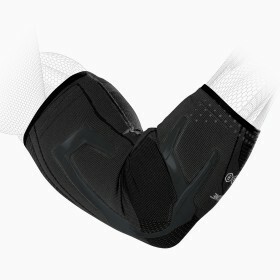 The Trizone Elbow Support has three distinct compression zones which include: a stability zone with strategically placed injected silicone to provide support for the elbow joint and the benefit of enhanced proprioception, a compression zone which improves circulation and provides mild support to the joint structure and surrounding muscle tissue, and a comfort zone that provides lighter compression for enhanced fit and better range of motion. The Trizone Tennis has three distinct compression zones which include: a stability zone with strategically placed injected silicone to provide constant pressure to the medial/lateral tendons in the forearm and the benefit of enhanced proprioception, a compression zone which improves circulation and provides mild support to the joint structure and surrounding muscle tissue, and a comfort zone that provides lighter compression for enhanced fit and better range of motion. Either would help depending on where you are needing more support. I have received a cortisone shot already for tendonitis. I still suffer from some inner elbow passion and discomfort on the bicep. Golf is a multi times per week activity prior to this injury. Is the tennis/golf brace the right brace or the full elbow sleeve? The Tennis/Golf support would be the appropriate support for your elbow. Should this be worn tight? Will it slide off if its too loose? I've used the AirCast Strap and this works much better at reducing pain, was more comfortable and stayed in place better. True to size. I was near the top of the large size and it is pretty tight but not too tight. Just what I expected in terms of tightness. Pros: Excellent pain reduction. Relatively thin, could be worn under long sleeves. Stays in place even pitching baseball. Superior to AirCast strap in all respects. Cons: None so far. Used 3-4 times. Stays in position pretty well, well designed. Helps considerably in decreasing pain. Cons: My arm measurement is at the lower end of the medium range, and I feel it would work better if just a little tighter. This brace is much more comfortable than the strap-type braces. I am only wearing it occasionally and for daily activities, so it works well for me. OK, but I think it would be better if it was tighter. I ordered the size Medium, which was true to the description for the circumference of my forearm. But the brace is rather loose. I think it would work better if it was a little tighter! Pros: Seems to be good quality, and it is comfortable. Cons: For sizing, I would suggest going down one size from the sizes described. This brace is good but not snug enough for me. I'm amassing a small collection of elbow supports. I have an Aircast which provides more support but is like wearing a balloon strapped to my arm. The Donjoy is much less conspicuous; I am a professional musician and need something that won't be obvious on stage. I can wear it for hours and not notice that it's on, although it does seem to stretch out after a while. This support fits well and puts the compression in the right spot for me. It is also smaller than other supports that I have and is easy to pack and take along if needed. 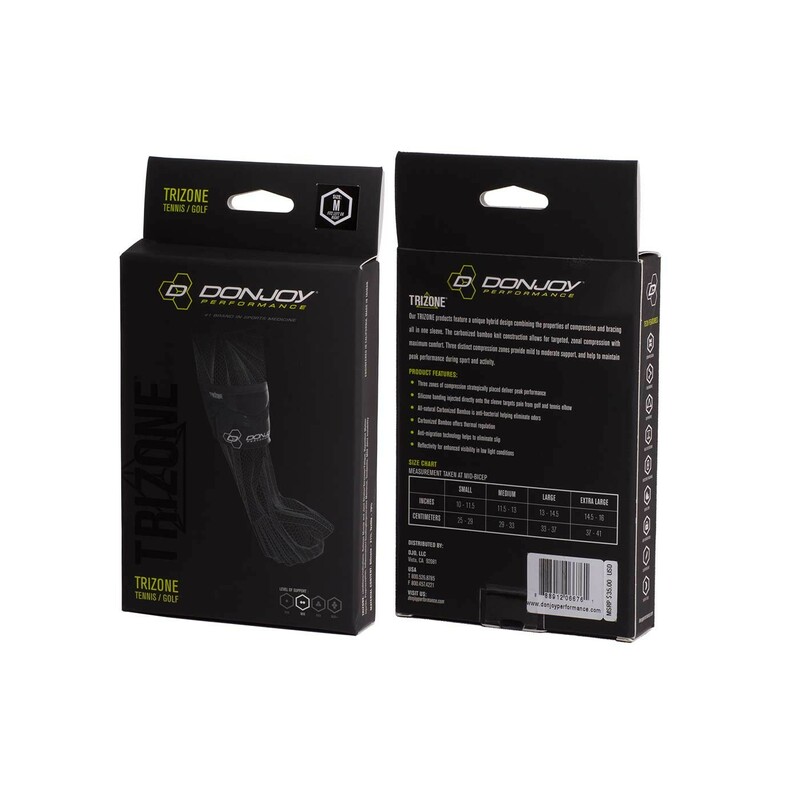 Very good product, have had no tendonitis issues since I began wearing this when playing golf.